A new startup incubator has just opened in Manhattan this morning, adding to a growing list of facilities meant to help support seedling New York City biotechs. LaunchLabs, first announced by Alexandria Real Estate Equities a year ago, officially opened its doors and revealed the 13 startups that will grow there. LaunchLabs is a 15,000-square-foot lab and office space that will effectively serve as an incubator inside the Alexandria Center, a sprawling campus on Manhattan’s East Side that up until now has largely housed outposts for pharmaceutical companies and startups already with substantial financial backing. Alexandria (NYSE: ARE) charges upwards of $1,995 per month for shared wet lab and office space in the facility, and tenants can apply for seed cash through a fund led by the company’s venture arm, Alexandria Venture Investments. Jenna Foger, Alexandria’s senior principal of science and technology, says that the firm is setting up something of an evergreen fund for Launchlabs startups that will put anywhere from $100,000 to $1 million in each company it backs. The cash will come from Alexandria Venture Investments, with decisions vetted by a six-member group of biopharma and venture experts. The fund could reach $25 million over time, as Alexandria has mentioned previously, “but we’re not capping it,” she says. Along with the opening of the facility, Alexandria awarded one of its biotech startup tenants, NYU Langone Medical Center spinout Neochromosome, a developer of synthetic chromosomes, its inaugural $100,000 entrepreneurship prize. The startup was co-founded by Jef Boeke, the director of NYU Langone’s institute for systems genetics, and Joel Bader, the interim director of Johns Hopkins University’s high-throughput biology center. The other LaunchLabs startups span areas such as gene therapy, cancer immunotherapy, tissue regeneration, and computational drug discovery. Their names: Beagle Bioscience, Chimeron Bio, 3d Bio, Aratinga.bio, East River Biosolutions, ENB Therapeutics, Gotham Therapeutics, Hookipa Biotech, Renovo Pharmaceuticals, Gencoves, Sevengenes, and Sonify Biosciences. Foger says the facility is about half full. According to LaunchLabs general manager Blake Stevens, the incubator will probably hold a total of between 20 and 30 companies. It’s being selective about its tenants. “We’re very much focused on the quality of the companies over timing of filling the space,” Stevens says. Once LaunchLabs is about 90 percent full, for instance, Alexandria might leave the excess room in place so some of its current tenants can grow. LaunchLabs adds to a growing number of biotech incubators around New York City. Harlem Biopsace in West Harlem is meant for the one to two person startup, and SUNY Downstate Medical Center’s incubator and BioBAT in Brooklyn are more geared towards the larger entities that are further along. (Harlem Biospace charges about $995 a month for a workstation, while Eva Cramer, who runs SUNY Downstate Medical Center’s incubator, told Xconomy in 2015 that her incubator charges about $40 per square foot per year.) More recently, the New York Stem Cell Foundation just opened a new lab and possible incubator space on the West Side of Manhattan. 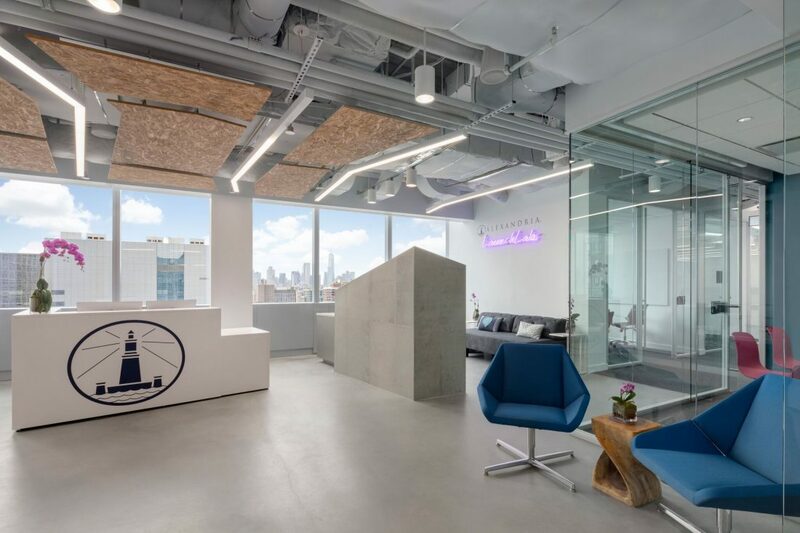 Johnson & Johnson will open a JLabs incubator in the New York Genome Center next year, and rumors have swirled that an announcement about another incubator is expected soon. Stevens says LaunchLabs’s $1,995 base rate—which gets a startup a workstation and lab bench at the incubator, which is equipped with an Illumina sequencer and other amenities—is priced “right in line” with other biotech startup spaces in New York City. “It’s a little more money, but it’s a little more space,” he says. The bigger difference between LaunchLabs and other local incubators, Foger contends, is the seed cash and access to Alexandria’s network of advisors, mentors, and service providers. “You don’t have all of those things at any of the other locations,” she says. Piece by piece, these facilities help give New York institutions and entrepreneurs the chance to spin out companies and start them locally. But there are other, significant problems that need to be solved. Affordable living space remains an issue, as is recruiting top level, experienced talent to guide biotech companies in New York. Foger says Alexandria is looking for places around New York City that might help. “It’s certainly something that we’re actively working on,” she says. Here’s more on the state of biotech in New York, and the challenges ahead.